same bundle as architect (noted earlier). Cubic Garage features a rather elaborate package, a small booklet format larger than the average CD wallet, in which is mounted one of 21 copies of the limited-edition CDR. 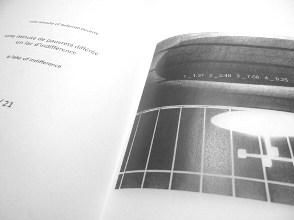 There’s also a printed insert sandwiched between layers of permatrace, concealing the artwork, obscuring the messages. With all the white space, lower-case typography, and aura of severity, I’m reminded, as I often am, of the packages we used to receive from winds measure recordings, which in turn put me in mind of minimal and cryptic artist’s books that I have some distant memory of seeing in display in the Whitechapel bookshop once (something you’d be unlikely to see these days, I warrant). On the disc, Gerard offers us his usual strategy of granting us micro-seconds of musical information in between long silent passages, a trick which today is having the effect on me of a form of torture – unbearable tension waiting for the next sound to appear. Blink and you miss it. Matter of fact it’s so unobtrusive most of the time you’re not even sure you heard it. If the intention is to create scads of ontological doubt in the poor noggin, consider me fully processed in that area. Where do I report for my next dose? Gerard plays the cello I seem to recall, and if you’re lucky you might be able to savour a tiny fragment of warm cello bowing for less than half a nano-second, but don’t count on it. It’s more like a stab than a bowing action…or perhaps a tiny needle dart, a pinprick in the gigantic shoulder of the human race. If you manage to locate a sound, I’d advise you to grab it with both teeth and chew it for as long as you can, even if you feel you’re being asked to “eat the air, promisecrammed”. So far I’m reminded of the B.C. cartoon strip by Johnny Hart, where Grog catches a snowflake on his tongue and chews it for an inordinate amount of time. (Punchline is: “the poor schmoe got the one with the gristle”). monochrome gem of inscrutable beauty and compacted information. Those numbers you see are overprinted and just tell you the times of the five untitled tracks. But look at those shapes and that grid device…are we now inside the cubic garage? Is it nothing more than the space where Gerard parks his Bugatti? I totally love the vague oval shapes, especially the looming shadow on the uppermost part of the image, and right away mistook it for an airship, a blimp. Matter of fact I intend to use this image as an alternative cover to Led Zeppelin’s Presence. It’s a perfect fit. Having completed today’s spin, I find there is a lot more sonic detail on offer than I might be making out, including about five seconds of real-time location recording where the outside world makes an appearance to this otherwise sealed-off experience, along with Pierre singing. That moment alone is worth the admission fee. There are also tasty plucks, strange hums, eerie piercing tones, and segmented samples which if strung together in the right order might reveal something about this “deferred poverty” that occupies the composer’s mind. If you enjoy solving crossword puzzles while listening to music, here’s a way you can kill two birds with one stone. The third record is called Études (Rhizome.s #19). The first composition in seven parts is called ‘L’innocence a la verticale (sur la falaise)’ and was composed by Pierre Gerard. This minimalist piece uses a lot of silence and small electronic tones, but also some fragmented materials sourced (in a very roundabout way) from real instruments – alluded to here as “a stringed instrument and a wind instrument”, keeping it unspecified just in case we were tempted to get distracted by detail. Gerard himself adds a cello to the work. Actually the method might not really be that roundabout, but the explanation – the longest we’ve read on one of these releases so far – certainly is, and adds another layer of distancing by mentioning the name of a third party (Luigi Turra) involved in this “sourcing” action. What this amounts to is ascetic, severe, blank. It’s certainly nothing so vulgar as sampling; we’re now in the exalted realms of something much more conceptual, profound, and distilled. The micro-shards of musical information are short and cut-off, only allowed into the body of the composition after passing the strictest possible tests for admissibility. On the surface, I’m reminded of the work of John Wall, who used to be the go-to guy in the UK if you wanted samplebased electronic art music delivered to your doorstep in a highly compressed manner. But at least he made a sound you could hear. Gerard seems to live in dread of emitting any messy aural stains which might mar the clinical beauty of the silence. There’s also the matter of his rather elaborate title, which seems to put the listener in a very awkward situation; as though we have to climb a sheer rock face, like mountaineers, in order to understand or experience this music. You can bet that Gerard would remain unmoved by our complaints and would not furnish a single piton to help us on the ascent of this smooth rock wall. I admit to being mystified. You really must see the Bandcamp page of this Belgian genius; each cover a master-statement of beautiful understated greys. stringed instrument and a wind instrument", plus cello from Pierre Gerard. I am not sure if he in anyway transformed the sounds of Turra, or whether he simply plays along with them. It might very well be the latter thing, but who knows, maybe not? It is not easy to tell judging by the music. Music that is very silent throughout this, with very sparsely distributed sounds, and very few occasional bursts of digital interruption. It's some very demanding or very meditative music, depending on how you wish to approach this. There is no additional information regarding the Duplant piece, which is subtitled 'sans paysage', which means 'without landscape', perhaps referring to the fact there is no field recordings used? Or maybe something like that, as I believe to something of that kind. Again I might be wrong (information, you might have guessed this, is not really forthcoming), but this is, unlike Gerard, not really quiet and actually quite present. I didn't count but these twenty-five minutes are indeed chopped up into smaller pieces, of buzzing electricity, faulty wiring and electro-magnetic pick-up, rusty doorbells and who knows what else. It hears very much as one work and not as forty-two small ones. One long etude perhaps? Soon after discovering the work of Pierre Gerard four or five years ago, I rapidly became a completist. This was occasionally something of a guilty pleasure, as instead of listening purposefully I would often take advantage of the luxurious expanse of his minimalism to cleanse the palette. An excusable habit for hyper-consumers of audio like myself, but one that listeners should avoid repeating with his newest release on Senufo Editions, Architect. To begin, Gerard appears to be playing with the concept of manual and manufactured aesthetics. Expanding on the titles’ analogy a bit, the birth of modern architecture was largely a result of technological advances in production methodology. Instead of materials both crafted individually by human hands and bearing significant physical and aesthetic properties of their original state, construction materials began to be developed mechanically, serially and in forms increasingly divorced from cultural design or social imperative. Likewise, the ability to reproduce sound acousmatically, that is, without requiring the presence of its original source, had a similar impact on musical composition. Recording and audio reproduction technology commonly allowed a critique or, at best, a reconstitution of aesthetic norms (at worst, it repeated them for yet another century). Architect mines both of these methods of production for meaning and metre. What makes this work initially stand out, especially to a listener with some knowledge of Gerard’s past work, is that despite the accretion of sound in a largely deconstructivist manner, much of the source material Gerard uses and digitally arranges across (particularly) the first and third pieces is in fact recognizable as acoustic instrumentation. Its most notable use is in the opening ‘Architect Ι, The Mechanics‘, where the natural attack, decay, timbre, pitch and amplitude are periodically allowed to exist and even harmonize unadulterated. By contrast, the more aleatoric second track, ‘Architect Γ, The Structure Of A Rock On A High Mountain’, reduces the audio envelope to subharmonic and heavily time-shifted scales where such sources are indeterminable. 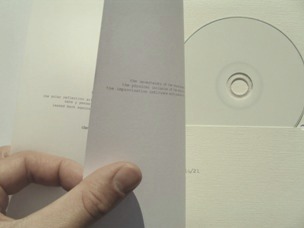 The question of whether or not the samples of the first are used on the second (or final) track may be answered by the work’s subtitle: ‘Three studies on what surrounds us and which remains sometimes invisible’. However, in my opinion the recitation of the iconography of traditional musical aesthetics is the more important contribution of the opening piece. With notes from the diatonic scale fresh in the listener’s mind, albeit rather few of them, he or she is left to re-evaluate their expectations of just what constitutes musicality across the rest of Architect. ‘Architect Γ…’ in particular challenges the manu-aesthetics (to borrow a term from architect Rifat Chadirji) of ‘Architect I…’. Revisiting the subtitle, the listener would expect it sufficient to examine the unheard or under-appreciated dynamics of the sonic range heard in the first piece. Gerard goes rather beyond this, however. Rigorous silence so efficiently decontextualizes what sounds do appear as to necessarily lend their sonic characteristics a sort of self-induced logic and stability. Using a palette found more frequently in his oeuvre than that on ‘Architect I…’, Gerard aptly finds appropriate timescales for these auditory fundamentals to play out – occasionally stuttering, other times droning, but always resolving as a self-sufficient monad. The recurrence of recognizable classical form in the last piece, ‘Architect Ξ, The Distance Between The Elements In A Small Forest Area’, has the quality of an apparition and is frequently directly contrasted and in turn harmonized with more synthetic counterparts, bringing the dichotomy of the first two works to a rather pleasing resolution. All that said, I would be doing a disservice to Architect if it was implied that the album works only on a conceptual level. Given its delicacy and balance, it is easy to empathize with Gerard’s auditory ethic. The hissing recording artefacts that blink in and out of existence across the work are both implicative and dramatically tense. The spacious minimalism and simple structure allows what would be mundane notes and rhythms on other albums to feel sonorous and carefully crafted on this one. Gerard has a well-developed ear for microsonics and as a whole Architect is a delightful listen. Through the label of Pedro Chambel, we heard the music of Belgian composer Pierre Gerard on a split record Études released with Bruno Duplant. Consequently Gerard himself sent us a package, which landed here 17th January 2018. The CD architect (senufo editions # fifty) is packaged in a very attractive letterpress cover. All the white space and small fonts (in lower-case natch) tip you off to highly minimal contents. Cover image baffles. For some reason I thought it was a modernist light fitting hanging from a white ceiling. Now I think it might be some untipped cigarettes in a dispenser. This might be the reward for the listener, even if they do not smoke. Gerard’s work. To navigate this space, Gerard’s plan on ‘the mechanics’ is to propose a 20-minute block of total silence, whose serene beauty is only occasionally interrupted by tiny fragments of sound, fragments which might have some basis in music. Low hums, creaks, imperceptible drones. We’re in the presence of a church organ played by the world’s most diffident and philosophical organist, who only communicates the melody of the hymn to us with two or three understated notes at a time. The congregation can do the rest. ‘the structure of a rock on a high mountain’ continues this theme, though with recognisably different elements. Fluttering as of butterfly wings, plucking strings, strange unidentifiable rustling. The occasional sharp cut-off effect which surfaces now and again reminds me that Pierre Gerard works in small samples of sound, which he assembles with great deliberation, releasing small microscopic atoms of compressed information into the ether. We need to have a long memory to “read” this music, assuming that is we are intended to put the fragments together. Maybe the intention is to show how everything in life is unknowable, occluded, mysterious in origin. At all events this “mountain” suite certainly delivers more in the way of incident and substance than part one. Lastly, ten minutes of ‘the distance between the elements in a small forest area’. Near the start I heard a few precious moments of drone music that was simply beautiful – sounded like a plucked cello string along with a harmonium. But it vanishes almost instantly. I could happily have enjoyed a whole album of music like that, but Gerard’s plan is much more severe. Wait patiently and the next snippet of data may pass before us like a passing train (a very small train) in the middle of the night. As a philosophical contemplation of invisible things which surround us, this record invites the mind to speculate about it is that we might be missing as we go about our hum-drum lives, presumably rushing about too quickly to see anything and making too much noise to observe the real presence of these invisible things. They’re not supernatural beings at all, according to Gerard (I would guess); the fact he might see himself as an “architect” of this unseen space means that to him they are real, present, every bit as tangible as a concrete blockhouse or an elevated ring-road. All he has to do is reveal them. Perhaps compositions like this represent his attempts to create blueprints for our surroundings. We could talk Edition Wandelweiser, or Taku Sugimoto . . . but what would we really learn? So instead, let’s talk quantum mechanics for a moment (bear with me a moment). At a small enough scale (around the Planck length – a distance small enough that it is understood only theoretically) the Heisenberg uncertainty principle allows energy to very briefly decay into particles and antiparticles, which just as quickly react to destroy each other once again. The constant energy flux of these reactions would warp space-time enough, in a ‘frothy’ or ‘foamy’ manner, that it would no longer resemble the flat continuum of the universe on the scale we are familiar with. The shape of space-time at the Planck length is thus called ‘quantum foam’, so named by the theory’s founder, John Wheeler. In effect, it is an artifact of the breakdown of classical physics when they are taken to their logical extreme. Okay, so what exactly does this have to do with Pierre Gerard’s newest self-release of piano solos? I suppose scale (read: amplitude) makes all the difference here as well. This is a rather sparse trio of pieces. Usually a few notes every minute at the most. They are not played rhythmically, nor with any obviously discernible melodic or harmonic progression. Gerard seems to react to the recording circumstances as need be – holding off from the keys, or shifts and percussive uses of the piano whenever incidental sounds occur. But give them time, and even a fraction of your attention, and they with entrance. I would not be so presumptuous as to assume I understood Gerard’s intentions with the music, but the gain on the recording relative to the loudness of his chords on the piano suggests that playing the work at higher volumes is at least not unacceptable. While the ‘musical’ aspect of the work provides one narrative for the album (especially on track 3), its negative space provides another entirely. I was listening once more to the album (heavily amplified) as I wrote this, and would periodically realize I hadn’t typed a word for nearly a minute. I was instead completely transfixed on the possibly hallucinatory changes in the ‘noise’ present in the piece. These moments are not unlike the epiphanies referred to in Adrian Dziewanski’s review of Gerard’s other self-release from 2012, Principe D’Incertitude. The dilation and contraction of the listener’s focus, the music’s amplitude and the timbral shifts from piano to noise make for a timespan akin to the aforementioned frothiness. Alongside the obvious car drive-bys (which produce noticeable and rather soothing bass reverberations) there are minute changes in the distorted froth that constitutes most of the material between the clarion chords of the piano. When notes are played, they are static discharges of the friction built up in the preceding time-span. After several minutes of hesitation, mostly as the listener is unsure of what dynamic range to expect, the lowercase sounds rise to life. The structure is thus inverted, with the piano score demarcating the space (musical, theoretical, audible) ccupied by incidental sound and recording artifacts. Intensely introverted music that requires and rewards careful listening (I try not to cry wolf on that rather abused line, but there you have it). It is additionally beautifully packaged in handmade sleeves with printed vellum and kraft paper inserts, the edition of CDrs is limited to just 21. I seriously doubt they will last very long, so head to Pierre Gerard’s site to get a copy. One of my favourite contemporary musicians returns with a beautifully hand-crafted self release that's criminally limited to 21 copies. I was lucky enough to be graced with one, and like other exquisite albums I've showcased in the past, Principe D'incertitude is a perfect example of what the Scrapyard Forecast has always been about: exceptional care and quality in sound composition and presentation. Pierre Gerard's work often resides somewhere in the crosshairs of field recording and hyperminimalism. His ENVIRONMENT & Gesture release from last year illustrated this meeting of styles near perfectly–that particular work becoming a definite favourite of mine. Gerard expands on ideas employed in that work here, keeping in check his ear for terseness and microsound movement, while at the same time bringing in a wider palette of acoustic devices and environmental recordings. This is music that requires full attention to grasp, and I can say from experience that it benefits to close all the windows in your house if you're serious about giving this a proper listen (It wouldn't hurt to unplug your fridge either). What I've come to really like about Gerard's recent work extends beyond an obvious patience he brings to every piece. In his interest and attempt to eliminate the performer as much as possible, Gerard's work brings new meaning to the word organic. I'm reminded of when in the middle of listening to long works by Rolf Julius I've on multiple occasions come to a sudden moment of abrupt realization. That moment is spawned from the thought that no matter how natural, how seamlessly the music seems to swim from my subconscious mind to my conscious awareness and back again, there is always a maker behind it. Principe D'incertitude brings about a similar epiphany. And yes, I've come to terms with the fact that I perhaps haven't the slightest clue as to what these epiphanies truly represent, but it's safe to say that there is more going on in Gerard's work than a snap judgement can impart. Bien sûr, Pierre Gérard utilise des fields recordings pour composer. Mais il tient surtout à se faire une place dans son environnement, d'en être une partie sonnante. Avec des objets ou des instruments, il accompagne des gouttes d'eau qui tombent, des chiens qui aboient, des bruits de transports… La technique de Gérard est empirique et sa musique cache parfois des petits trésors, en plus de donner des preuves de sa présence au monde. Pierre Gerard and Andy Graydon's tape release from earlier this year saw a long distance sound exchange deploying themes of polarity and homeward migration. Gerard's take on the themes saw an ultra-minimalist approach – as he often deploys – that resulted in a nice piece of hushed concrete-drone music. As minimal as that piece was, it sounded tumultuous in comparison to ENVIRONMENT & gesture. On their own, the three tracks that make up the album give little to no reward for the listener, elapsing as lackluster environmental backdrops: a water droplet here, a rock thud there. After the 20 minute opener the sound of a stream is introduced, which slightly livens things, though barely. But Gerard hasn't just presented an album of boring field recordings, his intentions are far more earnest. From his perspective these recordings are the product of seamless improvisations, where the sounds of objects and instruments are integrated by the "performer" into an environmental soundscape by complimenting it as opposed to dominating over it. Rightly so, Gerard choose nearly silent locations to perform these passive improv sessions where even the slightest of movements likely had the potential to impede on his vision. In these recording situations discipline and restraint become important factors, and although the outcome isn't the most engaging, there is much revealed in the artist's intentions and in the sound work itself if one can spend time with it. Yes, this just might win you over. Recommended. Pierre Gerard is a master of the barely there brand of minimalism and a firm favourite here at Wonderful Wooden Reasons. His music is a perfect example of a truly ambient soundworld. His, often seemingly commonplace, sounds are so delicately positioned that it's all too easy to forget that there is a seedee playing and to thoroughly believe that these sounds are part of your immediate everyday environment. This is music that augments on a level of subtlety that I find deliciously insidious. It spoils you for more overt sounds, they become cloying and bombastic, and leaves you craving the delicate fragility of these compositions. Belgian sound artist works with objects and electronic devices. He has been active since 2007 releasing CD-R's, CD's and a cassette for the imprints White Line Editions, Koyuki, Dragon's Eye Recordings and 3Leases, among others. Drops of water are the main sound in this record which is electronically manipulated. The minimal aesthetic on this CD is sometimes close to silence and bits of tiny drops configure an special rhythm. El artista sonoro belga trabaja con objetos y dispositivos electrónicos. Ha estado activo desde 2007 editando CD-R's, CD's y un casete para los sellos White Line Editions, Koyuki, Dragon's Eye Recordings y 3Leases, entre otros. Gotas de agua es el principal sonido en este disco y que son electrónicamente manipuladas. La estética minimal de este CD es a veces cercana al silencio y pequeñas gotas configuran un especial ritmo sonoro. 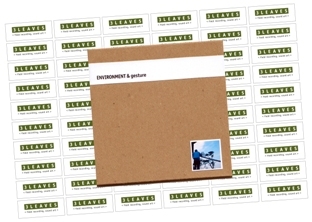 ENVIRONMENT and Gesture (3LEAVES 3L009) is the new release from Pierre Gerard , a Frenchman who is making a form of very gentle intervention in our daily surroundings with his near-imperceptible sonic actions, a strategy which to some extent aligns him with Jeph Jerman. His two main objectives are (a) to produce improvisations using common objects, not in the sense that he “dominates” the object like an imperialist invader seizing handfuls of sand, but rather to arrive at an integrated and harmonious situation where man and nature are brought one step closer to happy co-existence. As to (b), this concerns the more metaphysical ambition where he hopes his work will have an effect on time itself, causing a “soft impression” on the listener such that time starts to slide past in a more gentle and manageable manner, presumably a welcome antidote to the pressures of modern urban life where time has been sliced and parcelled into rigid divisions that suit the capitalist agenda. Gerard attempts the above by situating himself in a determinedly rural setting (water, stone and air are his materials) and creating gentle sounds which may involve dropping stones into a pond or engaging with a stream of water in some sympathetic way. The long 20-minute track contains such sounds occurring in sproadic intervals with lots of silence, and it feels isolated, stark, minimal beyond belief. However by the end of the album the external sounds of the environment also begin to appear, and help to put the work into context. I have reproduced the exact typographical rendering of the title of this release, which clearly stresses the element which Gerard regards as the more important of the two in his symbiotic relationship. In the moment when silence and its weak ruptures become unbearable for a man to sustain, a music based on those very characteristics is equally problematic. When an artist works with micro-elements such as Belgian Pierre Gerard, the challenge is that of pushing a listener to find new implications within acoustic milieus exploited to the bone. ENVIRONMENT & Gesture is a three-part piece whose linearity is somewhat displacing; even more puzzling is the positive reaction of this reviewer in front of natural components – mostly water and faraway environmental whispers, with the addition of an unspecified “instrument” – that have been used thousands of times before by other practitioners of the same area, with increasingly ho-hum results. However, I have come to trust Gerard pretty much throughout the recent past. His method cancels the ego completely, privileging the macrocosmic aspects of an introspective solitude. Accordingly, the work manages to involve to a point of complete participation “inside” the rarefied messages coming from the speakers. 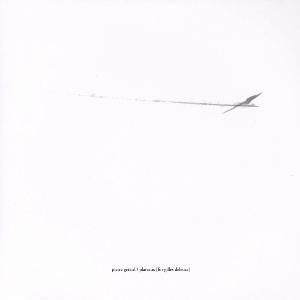 Despite the absence of surprises, this record is characterized by a wealth of recondite signals – wrapped in an awful lot of implicit meanings – transforming the hush that follows the end of the album into a deafening dearth of questions, as if all what we needed to know was already printed somewhere in the countryside's scents. My mind has flexed itself trying to wrap around this release’s many convolutions and multi-tiered, pock-marked constructs. Moreover, the music stretches across a great deal of musical territory—not just the mental territory I’ve created from its sounds. Side B has sections which recall Basic Channel’s extremely sparse dub-inflected moments, and much of the tape recalls early-’50s electronic and tape pieces, but there is something that separates it from that period entirely. I can’t figure it out. I find this release to be extremely original. Another magnificently packed tape, this time a split between the Belgium based Pierre Gerard and German sound artist Andy Graydon. As the story goes, Winds Measure commissioned these gentlemen to produce a work specifically for cassette. The two answered the call with magnetism , a theme that is as fundamental to migratory birds as it is to the functionality of analog tape. Gerard and Graydon began planning their work while focusing on two phenomena associated with magnetism: homeward migration and polarity, eventually settling on a process in which each artist would send the other a recording from their respective home environments to process and compose with – Graydon sending a recording of bamboo in the forests outside his childhood home on Maui, Hawaii and Gerard sending a recording of a wooden table located outside a house in the French village Espère. The A side, Orientation (Magnetite Crystals) , composed by Gerard, fits nicely alongside the minimalist extremes of previous Winds Measure productions – Richard Garet's L'avenir and Jason Kahn and Takefumi Naoshima's In a Room come to mind. The piece is glacial, coalescing as a motionless stretch of time over its 20 minute duration. Gerard's micro-movements of sound are often listless, though occasionally they become spring loaded, vibrating through the speaker cones for a split second before they are gone, a new sound taking their place. Very consistent and a great work. Graydon's side is for the most part equally as enjoyable save for perhaps a few over zealous moments, though he makes up for it in the lovely ambient sections peppered throughout. A fine job that strikes me as easier to fall into than Gerard's piece, though ultimately not as rewarding. Again, a worthwhile release from Winds Measure, and if you haven't done so already invest some time in this under-appreciated label. 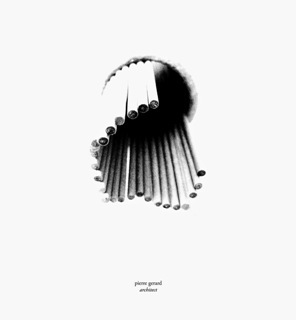 An interesting conceptual connectivity underscores this collaborative outing between Pierre Gerard and Andy Graydon. 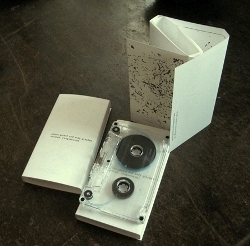 Having been asked by Winds Measure to create a work for cassette tape, the pair fixed their attention on the material dimension of tape technology, and, recognizing that the magnetism associated with the medium also plays a part in other magnetic systems (such as the navigation of migrating birds and the earth's polarity), each sent the other a field recording associated with his home environment for the other to work with. extended passages of hiss are as much a part of the piece as the punctuating elements. 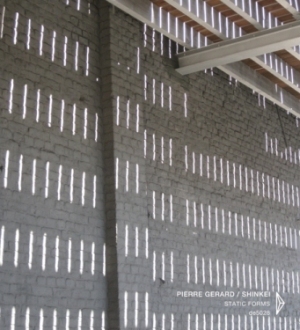 Side B features a two-part piece by Graydon called "Refrain" that documents Gerard's manipulations of a wooden table outside a house in the French village Espère. What results is a rather more active conglomeration of textures that suggests intermixtures of animal life forms and industrial sounds—even if such evocations are purely illusory. Regardless, the wealth of detail presented on side B—whistling tones, swirls, scrapes, and textural noise of one unidentifiable kind or another—keeps one listening throughout its twenty-minute duration. The collaborative project, which would be of interest primarily to devotees of textural sound art, nevertheless offers an engaging exploration of sound (trans)migrations. 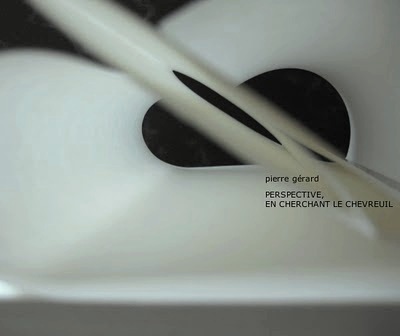 For thirty minutes, Pierre Gérard puts the listeners in direct confrontation with the variability of perception, on a merely physical/aural level and in sheer introspective terms. There is no scheme to mentally clutch to feel “secure”; no recourse to categorizations such as “silence” or “minimalism”. Just the asymmetrical concurrence of variously dyed frequencies and acoustic wrinkles that our ears may recognize as familiar derivations (faint suggestions of reed instruments, field recordings), or irretraceable hums that surprise, embrace and occasionally overwhelm, as it happens from the third minute of the fourth chapter, a section that left me aurally unbalanced for a few seconds afterwards. If you start “running after the sounds”, hopelessly trying to anticipate their design amidst the meaninglessness of a life's moment, disappointment lurks behind the corner. Expecting to understand an “architecture” here is a futile exercise which, needless to say, I had immediately implemented with meagre satisfaction. At one point, the explanation came all of a sudden. These are some of that transitory instance's fundamental components – “any moment's music”, if so preferred. Attributing deeper values or implications is dead wrong. The only clear thing is that they exist, ready to vibrate in sympathy within a given microcosm – environmental or corporeal. Mix this record with the whispering airstreams, the cheeping birds and the ricocheting whoosh of a distant town while lying semi-asleep on a couch, and the result is as near to cosmic exactitude as a person might wish. 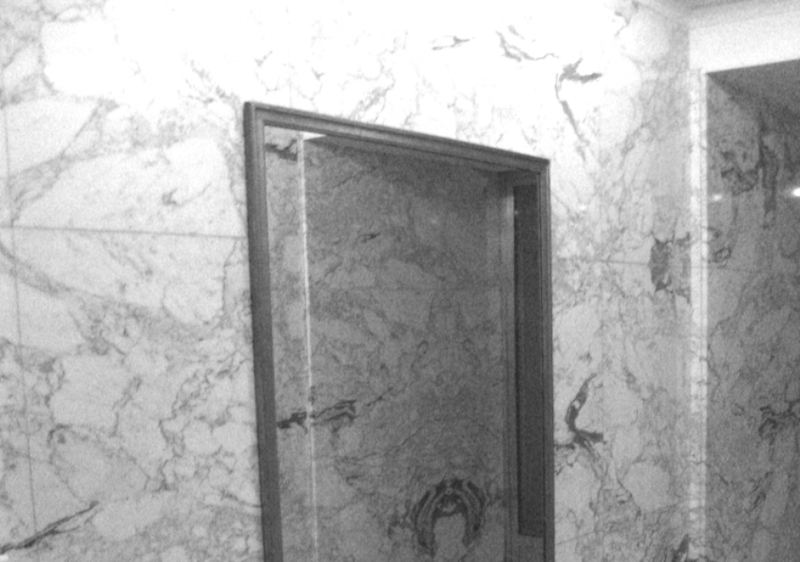 And if the hush of a sealed room is favoured, allow them to adjust your internal resonance rate without fighting. Filosofi di forme apparentemente statiche, l’italiano David Sani in arte Shinkei e il belga Pierre Gerard, chiamati in Static Forms ad appoggiare come sempre al silenzio sculture di suono che si plasmano intorno all’estremo filo dell’udibile. Difficile trovare due artisti così strettamente legati alle maniere, quelle più radicali delle arti minimaliste, per intenderci parliamo di musicisti che scelgono di svuotare l’ascolto muovendosi intorno alle pratiche d’estetica. movimenti di campo e di volume. Per Shinkei -all’apparenza più legato all’azione – invece l’arte del dettaglio alla Roden e la poesia degli oggetti di Rilke allaccitta alla pratica della lower case music e come sempre con la predilezione per suoni prettamente acustici. Tutto il resto è una continua riflessione sonora tra bassa frequenza, suoni oggetti, field recordings, sfrigolii di particelle, interruzioni, pieghe e frammenti. Come diceva Arthur Russell quello spazio estremo (qui in poco più di trenta minuti) in cui non puoi portarci le percussioni, ma in cui portare la mente. 33 minutes subdivided in two individual pieces. Gerard's is the longest one, inspired by John Cage (repeatedly quoted in the press release; let's not forget that those sentences opened the road to all kinds of artistic nonentity, thus I tend to read them with a mixture of perplexity or, if you prefer, unconvinced respect). 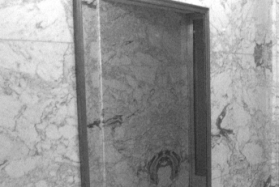 Unspecified instrumental and environmental sources – some of them identifiable, others not – give life to brief flashes of incidental activity in between silence. These sounds are “just there”, appearing and dying instantly, without pretending of being remembered – and, in fact, they won't. A well-mannered statement, but Bernhard Günter it ain't. Shinkei (David Sani) tends to let the frequencies work a little more, immediately starting with a Francisco López-like subterranean rumble which, right after, leaves room for the kind of micro-activity that is audible only in a completely silent setting, inserting rare notes of a slightly detuned piano for good measure. The blatant noise of rolling glass bottles – or are they? – trashes any good intention, ruining the suspension that the beautiful beginning had created; penetrating electronics manage to save the track from an unexpected disaster. An impressionistic piece, so to speak, that results less disjointed to these ears. However, this ground has become sterile by now, and not from yesterday. To quote Cage again, “we need not fear the silences, we may love them”. Après l'ambient drone de Wyndel Hunt, voici la deuxième production dont nous parlons cette année et provenant du label Dragon's Eye Recordings, basé à Los Angeles. Il s'agit cette fois d'un split entre deux artistes avec d'une part le liégeois Pierre Gerard et d'autre part l'italien Shinkei. Pierre Gerard vient de l'art contemporain et alterne entre pratique et recherche avec un goût prononcé pour l'abstraction. Après la peinture, le sculpture et la vidéo, il s'est mit à la musique en 2003 dans un premier temps à base d'objets et field recordings avant de se mettre aux instruments. Shinkei (de son vrai nom David Sani) est certainement un peu plus connu de nos lecteurs puisqu'il créa en 2000 le mail order Microsuoni qui, comme son nom le suggère était dédié au minimalisme et à l'art sonore. Depuis 2008, il dirige le label Koyuki sur lequel on croise FOURM (alias Si_COMM), Steinbruchel, ou encore Yann Novak, le boss de Dragon's Eye Recordings. On navigue donc dans le petit monde du minimalisme avec pour chacun des deux artistes une pièce unique de 15-18 minutes. Aucune explication ou note d'intention pour accompagner ce disque, si ce n'est une liste de citations de Marcel Duchamp ou John Cage, toutes relatives au silence, point commun des deux œuvres ici présentées. Les deux hommes construisent une musique que l'on qualifiera de musique concrète minimaliste. On décèle de nombreux bruitages, certainement issus de manipulation d'objets, des sonorités électroniques extrêmes, jouant avec les limites de l'audible (sifflement ultra aigu, infra basse), et quelques sonorités instrumentales. Des cordes frottées chez Pierre Gerard, certainement celles d'un violoncelle dont le corps semble être frappé, quelques notes de piano en intro et conclusion chez Shinkei. On aura tendance à trouver le travail du Belge plus proche de la musique concrète, l'Italien faisant plus fréquemment appel à l'électronique, mais les deux hommes jouent de la même manière des silences, interrompant sans cesse leurs instruments pour abandonner l'auditeur dans des failles sonores. Un album difficile, abstrait, qui demande une réelle participation de l'auditeur, mais sa courte durée semble parfaitement adaptée au propos. Les amateurs de beaux objets seront conquis puisque Dragon's Eye Recordings porte une attention particulière au design de leurs productions, mêlant simplicité et cohérence. Silence and space are punctuated by tiny electroacoustic gestures on this split CDR. Gerard's piece, "Wooden Mouldings for the Assembly (to Constantin Brancusi)", contains acoustic sounds: piano notes, bass tones and what are possibly woodblocks or found sounds. These are combined with slivers of hiss and static, occasionally panning through the stereo field and and rising in volume. Shinkei's untitled contribution is more abstracted, the sound sources more difficult to discern. Low rumbles and crisp static roll in and out, leaving silences in their wake. A piano enters the mix, then the sounds of clanking metallic objects and as the static rises in prominence the piece takes on a fuller structure until it recedes to silence again. The following sounds are louder and seem to jump out at you after having got used to the quieter passages. In place of traditional liner notes for Static Forms , Pierre Gerard, David Sani (Shinkei), and Dragon's Eye Recordings cite quotations by Pierre Gerard, Marcel Duchamp, John Cage, all of which reflect on silence, space, and emptiness as aural components. The two long-form settings that make up Static Forms naturally exemplify the qualities in question, with Gerard's “Wooden Mouldings For The Assembly (to Constantin Brancusi),” for example, stitching together minute fragments of electro-acoustic sound into an eighteen-minute amalgam that is as much dedicated to the rests between the sounds as the sounds themselves. That gives the piece a kind of stop-start feel, as whatever forward momentum a musical element introduces is just as quickly curtailed by the pause that's sure to follow. That Gerard's background is in visual art—drawing, engraving, sculpture, painting, and such—can be heard in the way he builds the piece incrementally, alternately physically shaping it with minute clippings of acoustic bass, electronic fizz, plucked strings, and piano and then stepping back to reflect on the work-in-progress before making the next move. Shinkei's untitled fifteen-minute piece is a similarly styled micro-sound (lower case or minimal, if you prefer) setting but one that exchanges a stop-start presentation for constant textural flow. The Microsuoni head and Koyuki label co-founder assembles soft crackle, piano sprinkles, subliminal rumble, and found sounds (rattling noises and the like) into a steadily mutating stream of fluctuating character. Be aware that both pieces are ‘static' sound sculptures that eschew dynamic contrasts and a conventional narrative structure that includes rising action, climax, and resolution. Este es un CD-R split de artista sonoro y videasta belga Pierre Gerard y el italiano David Sani aka Shinkei quienes presentan una pizza cada uno. “Wooden Mouldings For The Assembly (to Constantin Brancusi)” por Gerard con 20 minutes de duración de sonidos minimalistas, esto es, indicios de notas de piano, discretos sonidos de bajo, siseo y estática. Los sonidos entran y salen declarando que aquí la opción es la creación de espacios silenciosos. “Untitled” es la pieza compuesta por el director dell sello Koyuki David Sani donde la estática envuelve todo el tema, mientras que las mudas notas de piano entran y salen y la manipulación de objetos metálicos entregan una cruda textura, un tipo de contraste que encara un sonido puro y minimalista. This is a slit CD-R by sound and video artist Belgiam Pierre Gerard and Italian David Sani aka Shinkei offering one piece of work each. “Wooden Mouldings For The Assembly (to Constantin Brancusi)” by Gerard is 20 minutes long track of minimal sounds that is to say hints of piano notes, discrete bass sounds, hiss and static. The sounds come in and out declaring that the option here is the creation of silent spaces. “Untitled” is the piece composed by Koyuki's label boss David Sani where static aesthetic it wrap up the hole track while a muted piano comes out and the manipulation of metallic objects gives a raw texture, a sort of contrast facing a pure and minimal sound. Dragon's Eye once again provides us with a fascinating piece of electronic music for our listening pleasure. This work sees Pierre Gerard and Koyuki's David Sani delivering one piece of work each and they really are both leaders in this quiet minimalist style. Gerard's ‘Wooden Mouldings…' is a 20 minute investigation of silence and reductionist sounds. There would appear to be no specific concept behind this piece other than the fact that it exists – and honestly, that's quite good enough for me. Snippets of muted piano and ghostly voices are joined by distant bass rumbles and the occasional moment of hiss or static. Together they create a barely audible sense of isolation and yet it's easy to forget at times that there's anything playing at all. For me that's a strength of this type of work and I enjoy the sensation it creates. Shinkei's untitled track is, in many ways, even more minimal and sparse. There doesn't seem to be a single linking factor or theme between the two tracks but they seem to naturally work together. Sani's work is slightly more high frequency based, but not the type that will impinge on your senses. In the context of the other tones in the piece it's exactly what it demands as the sounds of static, microphone rumble and the rare occurrence of a plucked or percussive instrument work off each other in a wonderful way. In all then this is another extremely fine release from Dragon's Eye and comes recommended for fans of, amongst others, Line and White_Line. On se souvient de l'oiseau de Brancusi coincé en douane américaine : fallait-il le considérer comme une œuvre d'art ? Les douaniers retournent et retournent encore l'oiseau et les étranges bruits qui en sortent semblent être ceux avec lesquels compose Pierre Gerard dans une pièce qu'il dédie justement au sculpteur. Des bruits faibles entourés par le silence le temps que des interrogations naissent sous la casquette des officiers, un embouteillage d'idées partagées entre l'envie de bien faire et le souci affiché de comprendre de quoi il retourne. Ce sont dans ces soupçons que taille Gerard afin de former une abstraction contenant des propositions musicales en devenir et des copiés-collés qui demandent du volume, et pas qu'un peu. Une composition non intitulée de David ' Shinkei ' Sani – split oblige – suit la première pièce : des notes de piano optent cette fois pour un art concret sur des grésillements malingres ou la rumeur créée par des objets que l'on traîne à terre ou dont on joue. Des tonnerres de pacotille et des vents factices, un grain menaçant et des apparitions d'ordre numérique. Shinkei revient au piano pour finir, et conclut le disque qu'il se partage avec Pierre Gerard , que l'on appelle Static Forms. The prolific minimal-lowercase, sound art label, Dragon's Eye Recordings is documenting its own kind of “quiet music” genre with the release of Static Forms. 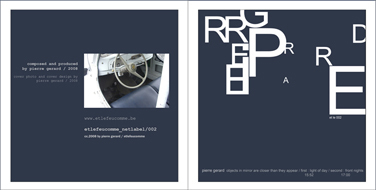 The two track cdr consists of one piece by Pierre Gerard and a track contributed by David Sani aka Shinkei. Though there is no indication that this release was a collaboration other than, presumably, a mutual willingness to share a cdr, it is evident on listening the pairing makes complete sense, with both artists exploring “negative sound space” in very similar ways. Shinkei begins his track, "Untitled", with a rumble that fades in then pans across the sound field. Surface noise from a turntable rides above the rumble to introduce melancholic sparse piano notes. It's a continuously evolving composition, as glass bottles clank and roll about and then a synthetic hollow noise field slowly simmers up. If I had to compare artists, Italian-born David Sani experiments more with the timbre and qualities of continuous noise to create an armature. Silence is the catalyst allowing his microscopic shapes to crystallize and take form. In fact, this track doesn't seem very static to me at all, as roughly halfway through, Shinkei subtly shifts the approach. His micro-composions begin to melt into a synthetic rainstorm. The rumbles now allude to a synthesized thundercloud. The weather moves fast, the piece speeds up with more activity. I like the pacing, more piano keys interspersed with delicate electronic crickets and then more rumble. The patterns start to stack, then after 15 minutes from where he began, Shinkei brings the track to a close. Unlike Gerard's contribution, Shinkei seeks to rely more on environmental sounding elements for his composition. The use of silence is important, but its placement fits more in sync perhaps with natural cycles of weather as opposed to man-made forms. In keeping with the typical Koyuki standards Plateaux is very minimal, both in the sonic and the graphic design (the latter courtesy of Luigi Turra). The inexpert ear could easily position it in the undeserved company of less significant onkyo-derived releases, yet this would be terribly wrong, as Gerard knows what he's doing much better than hundreds of so-called “alternative” artists. His sense of event placing is astonishingly acute: there's not a moment in the whole album in which a sound appears unnecessary or unwanted in that particular instance. Speaking of tone and timbre, he masterfully alternates vapour and grain, sequences of hovering low-frequency “presences” interspersed with jagged interruptions and piercing interferences, like needles waking us up from a hypnotic illusion. One feels isolated and enraptured at the same time, the practical incapability of defining the sources of these undersized daydreams an actual advantage. This mixture of dynamic activity, extreme accuracy and mesmerizing minimization of nervous peaks - clocking at the perfect length of half a hour - should not be left disregarded. Ormai è chiaro che i semi più fertili della scena elettronica minimalista germinano ancora. Dalla nostrana Koyuki arrivano i trenta minuti di Plateaux dell'artista belga Pierre Gérard . Seguace della più radicale arte minimalista - quella iniziata ai principi della scuola riduzionista di Richard Chartier - Gérard dispone le scritture al minimo, richiamando i più nobili domini in fatto di pratiche d'estetica, fisicità del suono e processi all'ascolto. Egli si distingue però per l'astrazione e l'orientata negazione del superfluo a favore d'impercettibili miniature sonore accuratamente scelte per estremismo d'intervento e scala dell'udibile. Se avevamo imparato ad impossessarci dello spazio con il movimento e le supefici in stratificate texture, in questo lavoro, a dettare le regole (in bit od elaborata elettroacustica), è la forma strettamente pura, che agisce sull'attesa e quasi in ombra (o sul contrasto scultoreo del segno) a diventare testimonianza di potenzialità sonora vs. silenzio. Abbiamo un nuovo poeta del silenzio tra noi. Né en 1966 à Rocourt en Belgique, Pierre Gérard est un artiste. Et 'Plateaux (for Gilles Deleuze)' est une composition, voisine des travaux de Richard Chartier voire de ceux de Roel Meelkop, qui joue avec les limites du perceptible dans une tradition de l'art sonore minimal. Électr(on)ique, discrète, précieuse et solennelle. Tirage limité et numéroté de 100 exemplaires. Limited edition of 100 hand-numbered copies. Subtile and minimal sound transmitting by belgian sound-visual artist Pierre Gérard. Dedicated to Gilles Deleuze. Pierre Gerard is a musician from Belgium who probably has an interest in philosophy. For his release Plateaux (For Gilles Deleuze) for Italian label Koyuki he even refers to one of the modern thinkers. I am not really known with the theories by Deleuze so I can't say if the music Pierre Gerard creates fits with this or not. Though, Gerard himself has a philosophic approach to music which he explains as “the music is the form of creation which enables me best to carry out an object without matter” . You could relate to this as music is a form of art without being able to touch it. The art lies in the form of the sound waves. Things that matter are duration, soundcolor and dynamics. The only physical about music is the media it is brought on (in the case of this album a cd-r). I think he has a point there. Nowadays with all music being available over the internet, either through file-sharing of digital download shops, to a lot of people the format in which music is published doesn't matter that much anymore. The essence of the music remains the music, and all the extras are fun but are not elementary. For the release Plateaux (for Gilles Deleuze) this theory gets adapted to the sound. Pierre Gerard does not play with harmonies, melodies and rhythms but rather sculptures with sounds. Main ingredient is silence, but when you turn up the volume sounds appear. High pitched sine tones appear and random glitches plop up. In the piece there isn't much development but more to the end there are also sounds appearing which hit the lower side of the spectrum. This is not really music you can write about very much. There aren't too many surprises but when you have heard more of this kind of minimal music you don't really expect to get some. Either you like this or you don't. For what it is worth I like it but wouldn't play it too often. 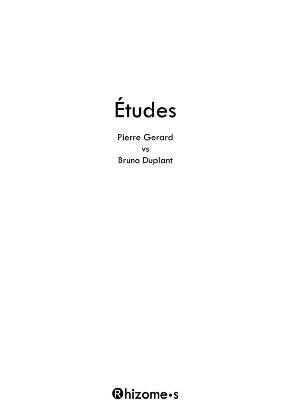 Over the last however many years I've been writing Wonderful Wooden Reasons the number of truly minimalist recordings I've been sent is extremely low yet this month I have two, Wechseljahre Einer Hyäne by Radu Malfatti and this newest release by Belgium composer Pierre Gerard. This is the sparsest of music. It's barely audible pops, squeaks, hisses and rattles are easily destroyed by the clatter of everyday life but in a quiet and relaxed environment they sing beautifully. I find music of this sort to be utterly entrancing but equally I find it incredibly difficult to review but hopefully I've said enough to intrigue you into buying.